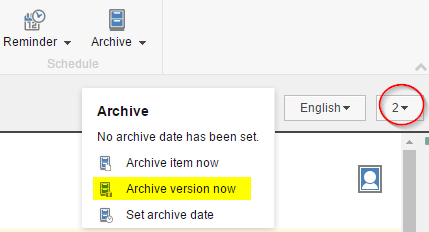 From the Review tab, in the ribbon, Schedule group, select the Archive Version Now menu item from the Archive dropdown. 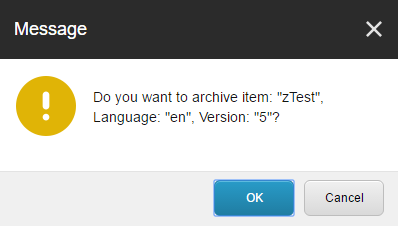 5 is the total number of versions I have but I want to archive version 2, which is the selected version. We have tested this in Sitecore 7.5 and 8.0 Update 3 (not tested on later versions) and they all behave the same. The value contains the (id=$Target) parameter so it is always selecting the latest version of the item (that is clicked from content tree). To fix the issue, just remove (id=$Target) from the field value, save. Hit OK and the selected version is archived. If you wish to restore the version, go to Sitecore desktop / All Applications / Archive and choose the desired item to restore.